The U.S. Department of Defense (DOD) today updated its policy dealing with religious apparel and hair grooming that U.S. service members can wear or display while in uniform, allowing body art and piercings in some cases. “The new policy states that military departments will accommodate religious requests of service members, unless a request would have an adverse effect on military readiness, mission accomplishment, unit cohesion and good order and discipline,” U.S. Navy Lt. Cmdr. Nathan Christensen, a Pentagon spokesman said today. Requests will be accepted on a case-by-case basis, according to the Pentagon instruction that updated the military’s religious accommodation policy. “Each request must be considered based on its unique facts; the nature of the requested religious accommodation; the effect of approval or denial on the Service member’s exercise of religion; and the effect of approval or denial on mission accomplishment, including unit cohesion,” states the updated policy. The changes will “enhance commanders’ and supervisors’ ability to promote the climate necessary to maintain good order and discipline, and would reduce both the instances and perception of discrimination among those whose religious expressions are less familiar to the command,” said Lt. Cmdr. Christensen. 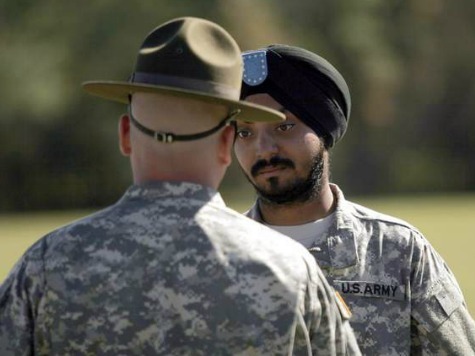 Immediate commanders may resolve requests for accommodation of religious practices that do not require a waiver of Military Department or Service policies regarding the wearing of military uniforms, the wearing of religious apparel, or Service grooming, appearance, or body art standards. Those requests that required a waiver will be handled by the “Secretary of the Military Department,” the new regulations point out. a. Impair the safe and effective operation of weapons, military equipment, or machinery. b. Pose a health or safety hazard. c. Interfere with the wear or proper function of special or protective clothing or equipment.